At least the Gophers did one thing right on their new uniforms is that they got rid of the messy flywire that became way too of an eyesore. And the black facemasks that made no sense. Two steps forward, at least five steps back. The oar. That’s supposed to represent all the boats on the 10,000 lakes! When I see the gray Gophers uniforms, I’m honestly reminded of the 2016 Pro Bowl. Which isn’t a good thing. And the chrome helmets are supposed to represent the bags of gold the Twin Cities rake in from Mall of America? Here's an explanation of the monstrosities from the designer himself. 2:15 "We want to understand what makes the University of Minnesota special...". I guess I just don't see what actually inspired the uniforms. This video showed images of high performance sports cars, sharks, track athletes, fighter planes, football players, and boats, among other historical images from the University. 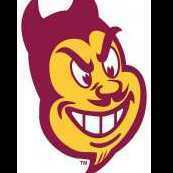 From that, they came up with an oar/compass rose/Ski U Mah identity? I don't get it either. Almost none of it seems to have been translated onto the uniforms. I really feel bad for the designer. Anyone who knows what looks good can tell you this is trash. I’m sure he was just listening to Fleck ramble about RTB. 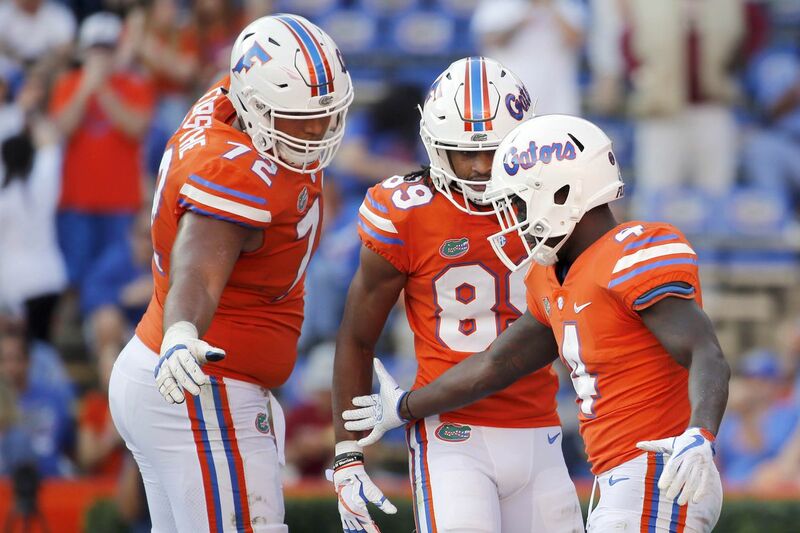 “I can guarantee you Game 1 we’ll be white pants, blue jersey, orange helmet because it’s my first game running out of the tunnel, and if you’re going to take a picture of me, you’re going to take a picture of me with the Gators looking like the Gators in my first game,” Mullen said. But in general, he said, the Gators will keep up with the times and be creative and open-minded in their uniform combinations as a way to cater to the younger generation of athletes they’re recruiting. “You know what’s amazing, the favorite uniform of every kid we recruited was the green uniform. And they’re the ones that have to win game for us,” Mullen said. 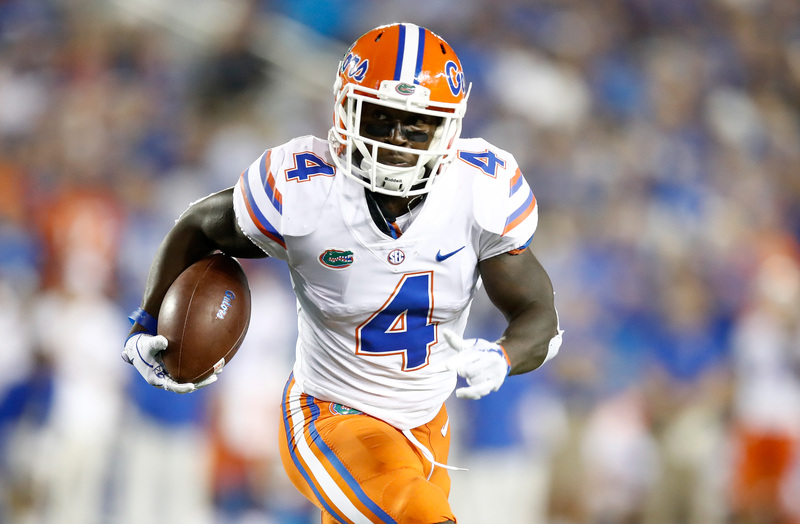 Along those lines, Mullen indicated the Gators will trot out a black jersey combination at some point. 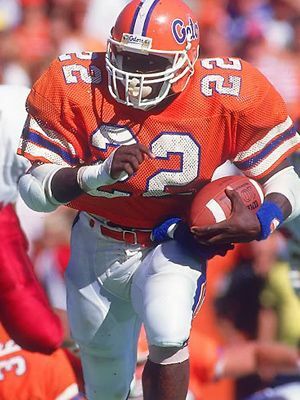 I like that Florida has, for the most part, avoided the uniform craziness (the green uniforms being an obvious exception) but think the team is certainly due for an update, which we may just get with the switch to Jordan. The only update Florida needs is to make their striping more consistent. I thought that's the change they were going to make last year, but they exacerbated the problem by making the orange pants stripes the same as the orange jersey (which was the only piece of the uniform that didn't match their striping pattern). 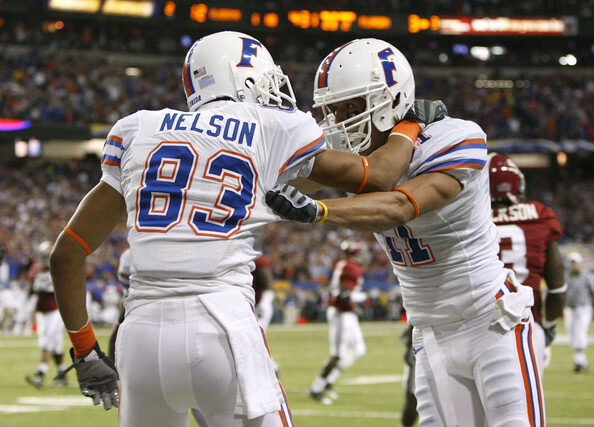 Florida is thisclose to having a great uniform, and I'll say is one of the few schools that successfully is identifiable and looks good when they change it up (mixing and matching the blue, orange, and white jerseys and pants, as well as both helmets). The orange helmet and pants stripe seen here are correct and the jersey should have been updated to match because then every single piece in their set would be consistent. 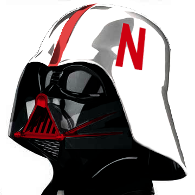 They also need to fix the stripes on the white helmet and pick one logo. Otherwise, the white lid is a great change up look for the Gators. 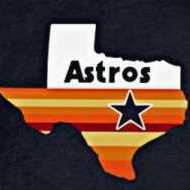 If it were my call, I'd stick with the "F" logo since it's kinda a throwback. Use the same stripes found on the white jersey and pants. As a side note, I did enjoy Florida last year making the widths of the pants stripes more consistent with the jersey stripes. The previous sets used to have orange stripes which were way too obviously thick, even though the stripe pattern was accurate. And if I'm nitpicking, if they're really gung ho about keeping the alligator patterned set, they should at least make it look like it's part of the same uniform set. 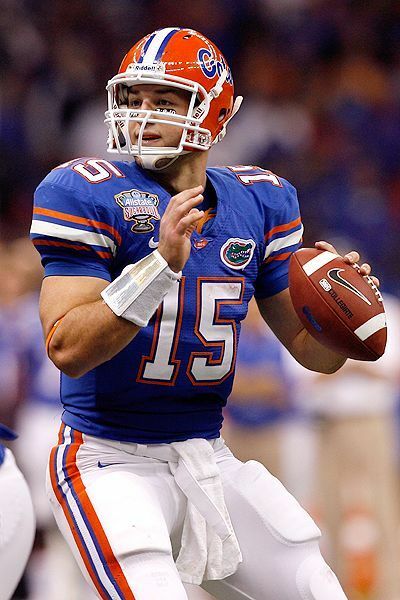 The Gators never wear a normal sized SEC patch on the chest, but rather a small one on the collar. This uniform, ugly in its own right, just looks out of place. Also another example of a school which needs to pick a helmet logo and stick with it. The Gator set has the Gator logo on one side and the helmet logo on the other. Nah. White lids and orange jerseys are Miami’s look. The Gators need to stay away from that stuff. I'd be fine with the white helmets if they had the F on both sides. I'm with ya, I really hope that 2017 is the last we see of unbalanced dual logo helmets. The F helmet is acceptable for me just because it looks so clean. At least the Steelers have the decency to forget one side of their helmet. I wasn’t advocating for that specific combination, but I was saying Florida looks good with both of those elements and both are traditional for them. 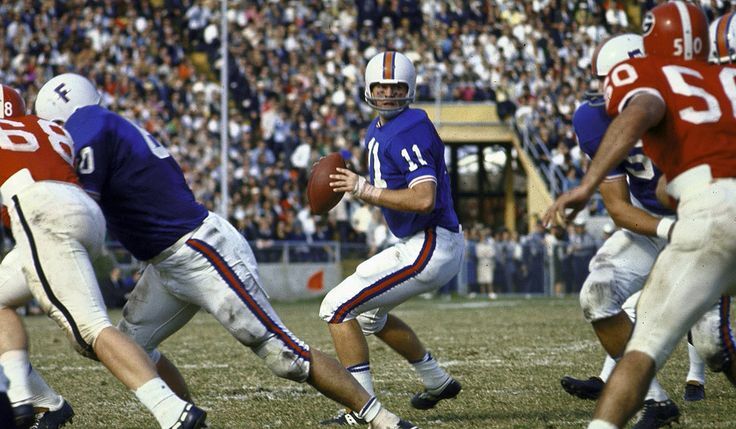 Maybe it’s because I was in high school and college during the Spurrier years in the 90’s, but classic Florida to me is orange/blue/white and orange/white/blue. The “Gators” script is nothing special, so I’m fine with swapping that for the very clean looking “F” helmet logo. Do that and they’ve got a top tier CFB set. Yup. 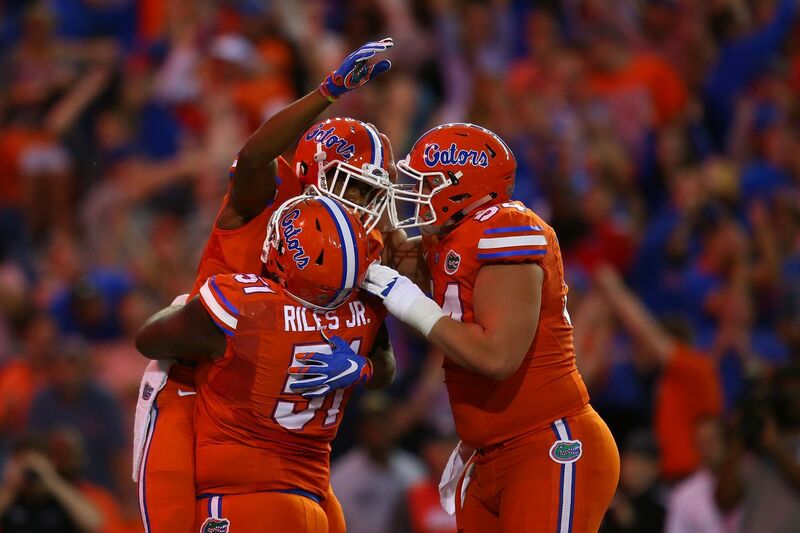 Best Gators look is Orange/Blue/White for sure. They have the Auburn problem of stripe inconsistency though. Fix the spacing and it's damn near perfect. Their striping matches on all 3 parts. From the middle-out it's white-blue-orange.